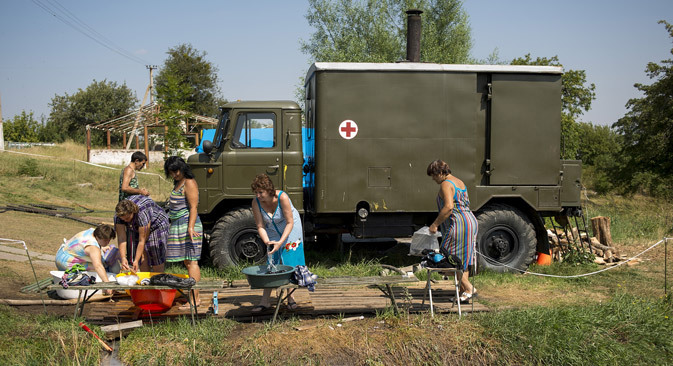 Ukrainians fleeing the war make the best of life at Mazanka camp six miles from Simferopol. Most will be flown to the Russian mainland after a week’s stay. Six miles from Simferopol, in the village of Mazanka, there are people who know that war is hell. A tent city here run by the Ministry of Emergency Situations serves as a transit centre and temporary shelter for people from the Donetsk and Lugansk regions of eastern Ukraine, where government forces have been fighting separatist militias. The conflict has made life unbearable for thousands of families, and their plight led to the dispatch of a road convoy of humanitarian aid from Moscow, viewed with suspicion by the West. More than 800 people are living in Mazanka and the flow of refugees grows every day. Buses transport them here from Simferopol. There are entire families of forced migrants, many with children. Scared and confused, the children embrace their mothers, who try desperately to come to terms with the situation. “Our house is not far from the city of Teplogorsk, which was heavily bombed and we were constantly frightened,” says Elmira Maltseva, from Stakhanov in Lugansk region. The territory she left behind consists of the towns of Stakhanov, Bryanka and Alchevsk, where factories belonging to the Ukrainian businessman and Dnepropetrovsk governor Igor Kolomoisky are located. The camp in Mazanka is several small tents and a dormitory building. The building also offers a toilet, shower and kitchen but there always queues. Although many homes were destroyed and several people have lost friends or family the residents are optimistic. Men and women live separately at the Mazanka camp: the women in the dormitory, the men in the tents outside. There are big rooms in the dormitory that can house up to 20. Outside, there is a sandbox for children. New arrivals feel strange but they adjust and immerse themselves in daily routines – preparing food, washing clothes, clearing rubbish and helping the newly arrived. Often you hear people asking: “How’s everyone back home?” Contact with towns in areas of military conflict has been lost for several days, but the migrants gather information bit by bit. The most reliable news comes from those who arrive at the camp each morning. People ask if their friends are still alive, if the houses are still intact, if the bombing continues. The refugees in Crimea came through Russia’s Rostov region, bordering Ukraine. Other routes are dangerous. Those who risked going through Ukrainian roadblocks complain about the bribes extorted from them. ‘‘A few times they tried taking us off the bus because we had a Russian exit permit,” Ekaterina, from Lisichansk, says. She was lucky: the soldiers let her pass, taking a total of about £10. Ekaterina will stay for about a week in the Mazanka camp, the average time that most refugees spend here. Then they are flown on a ministry plane to the Russian mainland. The Maltseva family, will be sent to Kemerovo in western Siberia about 2,200 miles from Moscow. Since the war began in south-eastern Ukraine, production in entire sectors of the economy has been shut down. “Our region was firmly connected to Russia. All the factories functioned thanks to Russian orders. Looking at relations between the two countries, no one knows how the regional economy will now work,” she says. The United Nation estimates that almost 730,000 people have left Ukraine and moved to Russia this year because of the war in the east of the country. Some 87 percent of the forced migrants are from the Lugansk and Donetsk regions. At the beginning of June, the number of refugees coming to Russia from eastern Ukraine was 2,600. By August 1, that total had increased to 102,600 people. Russia’s Federal Migration Service says that there are currently about two million Ukrainians in Russia, of whom 600,000 are from south-eastern Ukraine and 36,000 are living in temporary accommodation. In Russia, there are temporary accommodation points for refugees from Ukraine in Simferopol, Sevastopol, Belgorod region, Bryansk region, Voronezh region, Kursk region, Leningrad region, Rostov region, and the Moscow region, as well as in the cities of Moscow and St. Petersburg. Read more: Humanitarian convoy to Ukraine: Trojan horse or genuine aid mission?